There has been a movement to be Car-Free. It’s an appealing concept, but it would be a major challenge for most of us. What can be an easier alternative is to live in a community where you can primarily walk or bike. Often we choose where we live based on our jobs or the cost of rent/mortgage. If you step back though and reevaluate your choice by factoring in the cost of driving to every little errand, you could be surprised by the compromise you made. When was the last time you lived somewhere where you could walk to most everything? Or you just jumped on your bike for the pure joy of wandering? The limitations we all had on us as kids when we couldn’t drive were not perceived as limitations. Did it stop us from seeing your friends or finding ways to play and go on adventures? No Way! Michael Bluejay of BicycleUniverse.info has studied the financial consequences of this compromise. He provides a great Car vs. Bike Calculator and a compelling financial scenario that can be an eye opening. A lot of people love living in San Francisco or New York because they don’t have to own a car. Smaller communities can be harder to identify, but there is a great tool to help if you are considering relocating. Walk Score rates 10,000 communities of all sizes in the U.S., Canada and Australia. Other great international communities include Amsterdam, Paris, London, Singapore and Hong Kong. A few years ago, John took a position as a Harbor Patrolman at a very rural community of Two Harbors, Catalina Island. About 70 families live at Two Harbors year round but during the season it is a popular destination for Southern Californians to bring their boats and enjoy a slower pace of life. Living there we didn’t own a car. He walked to work, we walked everywhere for errands and fun. Bike rides were an alternative. If we really needed to get to the big town of Avalon (population 3,000) on the other side of the island, we took two buses and all day. It was part of the slower pace that we learned to love. The effect was life-changing. Never again will we be satisfied to live in a place that requires us to be car dependent. We may stay in a community that requires us to use our car but we won’t stay long. Here are a few of the benefits of communities that are pedestrian and bike friendly. We connect with people more, maybe with a wave or a hello but at least we are connecting. We notice more, butterflies, the tidal range, and the sound of the wind in the trees. We save a lot of $$$, we’ve been down to 1 car for years, but by walking or biking we save fuel and wear and tear on the car. Less stress. It is rare for us to be worried about the tailgater behind us. It may take more time to go to the store but the process is enjoyable. We buy less, because we have to carry it. Huge health benefits. Our weight has gone down, our strength and stamina has gone up. We don’t pay for a gym. Our cholesterol is down, our posture is better. People seem nicer when you’re on a bike. Anacortes, Washington is an excellent example. From the RV Park, which was about 2 miles out of town we could bike in for all our shopping, entertainment, recreation. We could bike to ferries to take us to other islands, put our bikes on the bus and go further, ride for pleasure, and ride to happy hour and have a drink and not be concerned about driving under the influence. We discovered so many cool little treasures because we would go down side streets at a slower pace and stop to check things out. 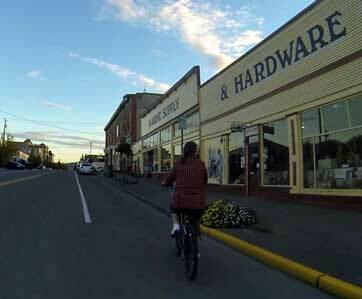 This is a town that has cultivated a bike and walk culture. Anacortes has well-earned it’s 100 on the Walk Score site. Hi, we totally agree. Anacortes is one of our favorite stops while we go along the road, full time RVing. You really told the whole story, I’m just seconding it. Thank you LeNan. You definitely know the area so we appreciate your Second all the more! Keep those comments in, you have a very unique perspective. Great to have you on the Caravan! Great story – our son, Clint, lives (almost…girlfriend, Brianne, has a car) car free and has for the last 5 years. One of his top criteria for buying a house was that he be within 15 minutes of work by bike. Sounds like your son Clinton is being eco-sensitive and having a great lifestyle at the same time. Hopefully he will inspire others to be as thoughtful in their lifestyle. Thanks for the sharing this! We just spent a week in La Conner and were in Oak Harbor and Sequim last year. Love the area and hope to keep this as a go to place for perhaps a summer home when we “get off the road” full time. I like La Conner as it is a small town and just enough but has Mt. Vernon, Burlington, and surrounding larger places to go to for the BOX stores when needed. Love the flowers and the organic farms and produce. Not too happy with WA tax structure or Seattle basin traffic, prefer Minden Nevada more but the weather is kinder and the natives (previous CA exodus) are very nice and accommodating. Hi Judith, we are delighted to have you join Itchy Nomads. Sounds like you enjoying a full time RV lifestyle. Isn’t it great! Would love to hear more from you on the places you especially like. We also really liked La Conner. Their Quilt Museum was a must-see even if you are not into quilts and we loved the food at Calico Corners little restaurant and gluten free bakery. We’d agree with you that the folks we met in the entire Washington state area were open and friendly and welcoming. We bonded with Anacortes because we could bike anywhere, including right on to the ferries to the San Juan Islands. The yummy fresh food and prolific flowers are everywhere, like you mentioned. There seems to be creativity in the soul of those little towns which inspired us along with natures ever present beauty. Please continue to share with us your favorite sightings as you travel. Happy Trails!